Happy Monday! Fall has always been my favorite season up until last year. Last October and November while I was pregnant with Isla I had the WORST morning sickness (except the sickness lasted all day and night. 24/7). I finally started feeling human again around December so I totally missed out on all the fun things that come with autumn time and I really wasn’t sure if I could ever love this season again. It sounds crazy, but even when I look back at photos from last fall I instantly get that nauseated feeling again. And when fall rolled around this year I was nauseous for a few days (the smell in the air was triggering weird pregnancy memories) but luckily I got over that and fall is once again my favorite season!! ps If you want your house to smell amazing go buy this candle! I’m obsessed!! Great look. Love the shoes ! This outfit is so perfect! Love your bag! I’m glad you are enjoying fall again! Love the shoes! Have a great week! Such a simple but gorgeous daytime outfit! Love your bag and shoes!! Loveee these jeans! And the colors in the trees are amazing. They haven’t all turned yet in New York! The perfect fall outfit! Your sweater looks so cozy! Pops of red are so chic during the fall and winter! Love this look. I just ordered this sweater, and now I’m so happy I did! it looks so cute on you! Red looks great on you! I am also loving that sweater, perfect color for fall! Love that sweater for Fall!! So cozy and cute! Love this outfit and the color combination for fall. That sweater looks so cozy! I have a similar sweater from Banana Republic, I love this look! It’s so funny how seasons trigger such strong memories. This look is darling! Love the color of that sweater! I’ve been on the hunt for a great pair of skinnies and I’m loving these! Love this whole look on you. Loving this look! The sweater (and shoes!) are on my wish list! That sweater looks SO cozy and warm! Love the pops of red… cute post, of course! Pretty! What a classic but chic look! This outfit has the perfect amount of chic with a little pop of red and leopard. Love it Rach! Beautiful shoes! That sweater looks so cozy. Those leopard Loubs are so fabulous! I really think that the red Celine might just be the prettiest color they make and your sweater looks so comfy! I’m glad that you are able to enjoy fall this year, it truly is such a pretty season!! Love this outfit! The pop of red in the bag, your lips, and shoes it so perfect! You look GORGEOUS! I am dying over how beautiful that sweater is! I cannot wait until I am no longer pregnant and can wear beautiful knits again! Next fall! I love your sweater Rach! I think a pair of animal print heels are a must have for the fall! nice outfit! Gorgeous sweater! Leaves is also my favorite fall candle. It smells amazing! Love that sweater! And everything else… and the background is gorgeous. You look so pretty! I adore this look, Rach! The colors and print work so well together! Thanks so much for the inspiration :) I hope you have an amazing day! That sweater looks relly cozy! And the bag is a dream! This outfit is so perfectly fall!! I love these Heels and the Background is so Perfect for this Outfit. I’m so glad you can enjoy fall once again. The first trimester of a pregnancy is the worst. I have two children and remember suffering through it 24/7 for at least 16 weeks. The good thing is that they now say that feeling this way means that your child will end up healthy and smart. I definitely have two very healthy smart children so maybe that’s why. I just wish there was an easier way for us Moms. As for your outfit, I love this look. The red with the leopard print looks fantastic. You look ready to enjoy fall again. I love this outfit! The pops of red are gorgeous! SO SASSY! I love this outfit!!! You are the cutest! Gorgeous photos! I love that turtleneck. You definitely need to make up for last year and do some fun fall things! You’ve got all the fall staples in this outfit! Love the last picture and this post and those TREES! So beautiful! love the sweater and shoes together. perfect fall outfit. Glad you’re back to loving your fav season again, it’s too good to miss. Hard to believe how quickly a year can fly by. Love the sweater and the heels are killer! I love this look..is casual and chic at the same time!!! Love the classic combination of the neutrals, red, and pop of leopard!! Such a great combo for fall! Fall is my favorite time of the year, too!! Im so glad to hear that your nausea this year triggered from pregnancy memories went away! This is such a classic fall look. I love the caramel sweater with the leopard heels. I love your red bag and red lips. Your hair color looks so striking with this combination. And I’m going to order that candle! You have the cutest style! Loving this outfit, it’s perfect for fall. I love this look!!! 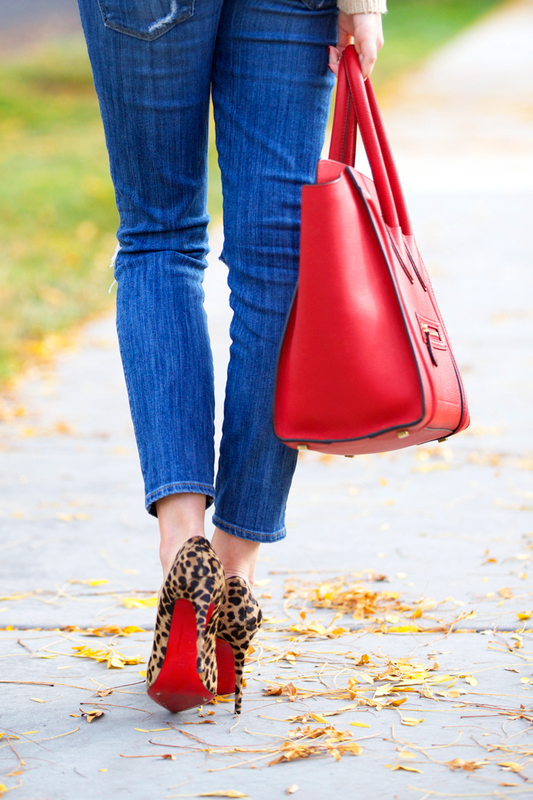 The pop of red from the shoes and bag are a perfect touch. We had this one air freshener when I was in my first trimester that made me nauseous. My husband plugged it in the other day and I needed him to quickly take it out as I was getting sick!! Love this casual look! Those pumps are gorgeous and I love the red lip on you! This outfit is stunning!!! So pretty Rachel :) glad the nausea is gone and you can enjoy now! I love this outfit so much I bought the whole thing! The sweater is particularly difficult to care for, Rachel would you consider doing a post on how you care for your most favorite pieces.